Advanced Technical Concepts was one of three Clare companies that received an All-Ireland Business All-Star accreditation in Croke Park on December 12th last. See the Clare Champion for more details. All-Star accreditation is an independently verified standard mark for indigenous businesses based on rigorous selection criteria on performance, trust and customer centricity. MD, Marie Clifford, commented “on behalf of all the team at Advanced Technical Concepts Ltd. we are thrilled to achieve All-Star accreditation. The accreditation process gave us the opportunity to reflect on our brand story, achievements, growth strategy and above all the value we create for all our stakeholders and in particular our customers. Receiving this All-Star accreditation as we celebrate our 25th anniversary makes it even more special. The opportunity to receive first-hand feedback from the panel, our employees, customers and suppliers through the reference check round was particularly insightful. I would like to take this opportunity to thank not only the Foundation but also my team and most importantly our customers and suppliers and all those that continue to support us. 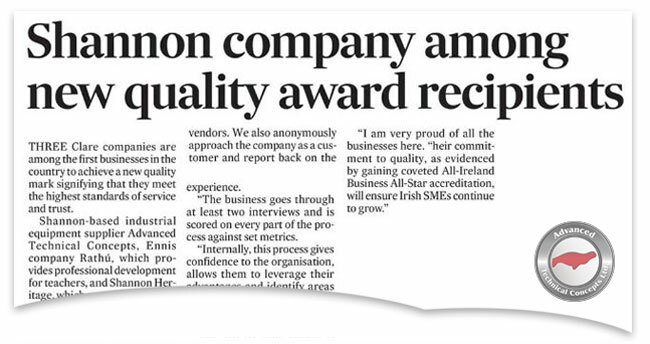 We look forward to continuing to meet and indeed exceed the standards set by the All-Ireland Business Foundation and collaborating with the TRIBE members”.